One good way to get at categorisation with relatively small numbers of responses is using a pile sorting task. Take your list of terms and write them out clearly on cards, one per card. Run the task with at least 5 people, preferably more. Lay the cards out in front of the participant, and ask them to sort the cards into piles, as many as they think are necessary. Once they've finished, ask them if they have a label in mind for each piles and note it down if they do (don't press: use "group 1", "group 2", etc. if they haven't got labels). With each label list of all the terms in the pile. Each cell is the intersection of a row label and a column label. In the cell write the number of participants who put the two terms in the same pile. The diagonal contains the number of times a term was in the same group as itself, which by definition is the same as the number of participants. The matrix is symmetrical, so each number can be entered twice, although the script will also work if you just fill out the lower triangle, i.e. numbers below the diagonal. The following script makes the MDS plot. It is run in the terminal, using the R statistical programming language. If you're using a unix system and you know how you can make this script executable and add it to your PATH. Otherwise you can run it with Rscript --vanilla similarity2MDS. 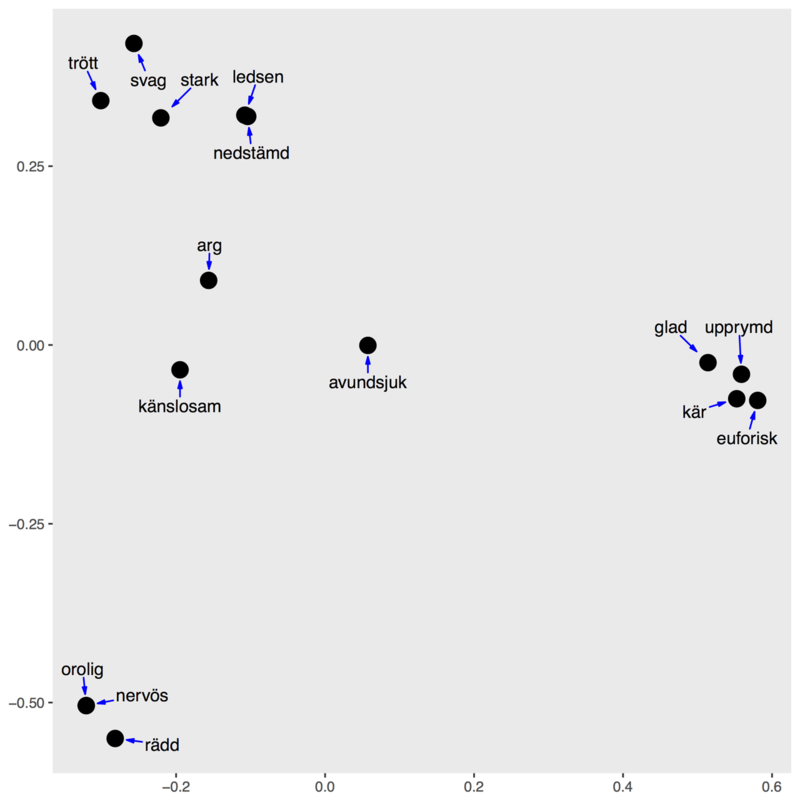 Note that ggplot2 and grepel are not part of R by default: they have to be installed separately.